Irish flag decal features the Gaelic words EIRE and Erin Go Bragh which translate to Ireland and Ireland Forever. This Irish flag decal is printed on waterproof laminated, durable vinyl stock with UV (ultra-violet) blocking inks. 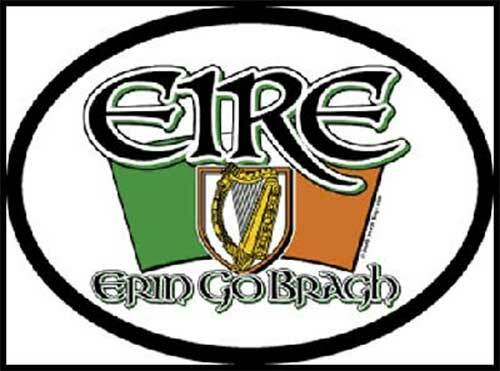 The Irish flag sticker features both the Irish words ERIE and Erin Go Bragh and has non-permanent adhesives for easy removal making them great for cars and travel trailers along with boats and motor homes. The 3 1/2” x 4 3/4” oval Irish decal is also suitable for trucks and motorcycles along with any flat surface. The Irish car sticker is made in the United States and is available at The Irish Gift House.